Published by Cyril Huze September 14th, 2015	in Builders, Customs and Editorial. 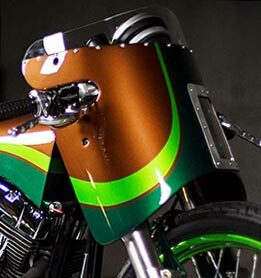 Unconventional designs (and paint jobs) are often the characteristic of young builders not yet fully immersed into the custom motorcycle scene because not yet much influenced by what others are creating. 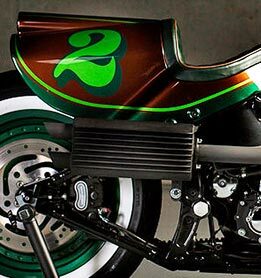 Swiss Tom Mosimann is by trade a sign painter who got the bug for custom motorcycles and decided 3 years ago to build his first project under the banner of GS Mashin. This Fat Boy (you didn’t guess) is his second work and his first done on a Harley. And if you are not distracted by the the very odd paint job color scheme, the bodywork deserves some kudos for the effort put into it. Mosimann wanted his bike to be his own built, and although not an expert at metal shaping did all the steel fab himself. For inspiration? Some lines and details he had seen on pictures of old Bonneville land speed racers. The steel massaging of a singular sharp edges gas tank, of a tall fairing, of a long seat base/rear fender and of a mini spoiler took most of the 9 months devoted to this year 2000 Fat Boy makeover. To this, add the time consuming task of bending and welding a one-off exhaust system and the fabrication of an air cleaner cover featuring the GS shop initials..
More inclined to work on looks than on mechanical features, the stock Fat Boy powerplant remains untouched. Mosimann went to a 21” front wheel but kept the factory rear wheel, improved the bike stance using a Progressive Suspension front end lowering kit and replaced the stock factory forward controls with Performance Machine mid-controls. 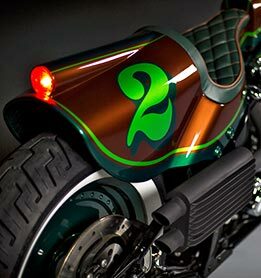 The rear section is kept clean by integrating the run/stop light in the rear fender. 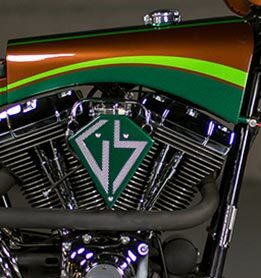 For accessories, he ordered LSL bars, Beringer hand controls, Roland Sands Design grips, installed an Auto Meter speedo and replaced the Harley primary with one from PM. Regarding the flashy paint job, the only thing I am sure of is that during bike shows it’s a magnet to attract spectators. And if you don’t like this brown and green clothing, imagine it all black, all silver of whatever color scheme you like. And it will look much better to your eyes… GS Mashin On Facebook. 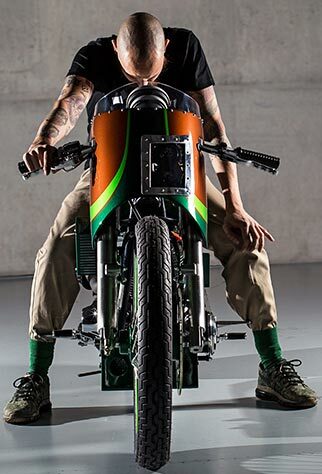 Not my style yet, still somewhat appealing, the only thing I would get rid of is that faring, just doesn’t flow with the rest of the bike, you know? 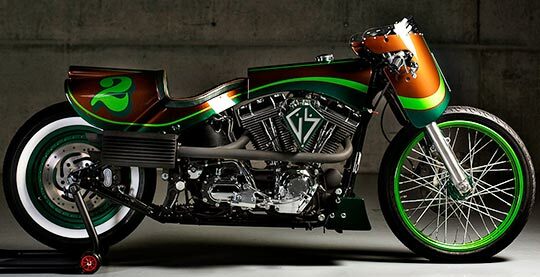 Dig everything about it except the fairing and the motor. 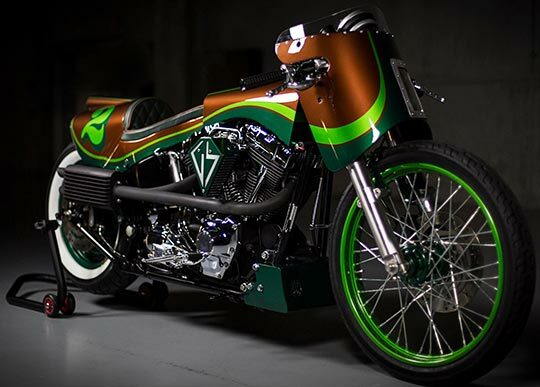 A custom built racing bike should have a high rev’ing high hp motor. Imagine if I built a big wheel bagger but put the motor from a Ninja in it, just wouldn’t be right. Cyril told you. He is a “beginner” and deserve encouragement. I have actually seen it in the flesh and as is so often the case – it does look better in real time. You never see things only at angles akin to an engineering drawing. It puts an entirely different spin on ‘dustbin’ fairing. A bit too much for my taste, but rest assured, nobody will ever just walk past it without whipping out the phone out. Very original. Like it. Would have done something to the ignition cables though. The white wall on back doesn’t do it for me. Otherwise it is very original. Not my style but kudos to the guy for doing his own thing. The exhaust and muffler are also very cool. Hey, thats pretty good. Has a bit of a steampunk vibe to it. Front to back, the geometry is spot on. The whitewall is the perfect touch to make us wonder (why). Well done. At a time when it seems like we have seen it all; this young builder has shown us there will always be new ways to present a classic cafe style design. 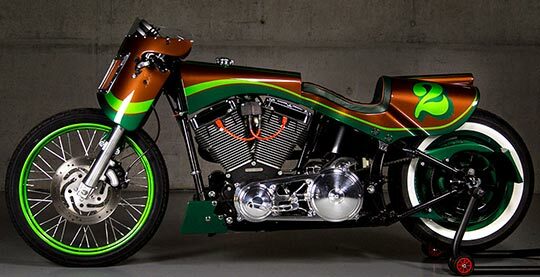 I can see how the rear white wall highlights the darker green of the back wheel and other parts there whereas the front wheel is the brighter green matching the green on the bodywork. I do hope a side stand eventually ends up on this bike so it at least looks like someone could take it out for a day ride. Never knew cut up sections of a 30 gallon drum could look so good custom painted. Not appealing to me but I don’t count, I’m not the customer. Good detail work for sure. This guy didn’t copy anyone. So, it’s great work. looks like that bike would be a “barrel” fun to ride !!!! Ride it over Niagara Falls and see if it will float. I got all happy with myself when I correctly rebuilt the four carbs on my GS, could not imagine having the skill to do something like this. Love the color choice in this time of blacked out bikes. I wonder where the folks back in the day that said… I don’t do computers… are now? Original…paint rocks, nice lines and whitewall rear slams it home. Nicely done. But a cool color combination. That is all…over and out. Well said. You get around, Andrew ! You know what it is … it’s DIFFERENT . Finally a new look that aint a bicycle with a motor in it. Congrats.